Admit you need a girl friend’s getaway this summer. Call your sister, mom or that one-of-a-kind best friend. 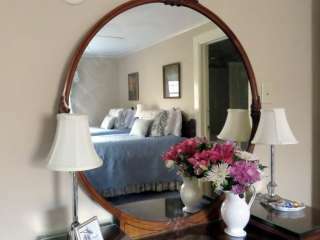 Celebrate your friendship with a vacation to Pinecrest B&B in Asheville NC. Perfect accommodations await in our Cowley Room with antique twin beds, matching vanity, and comfortable seating area. The bathroom boasts a clawfoot tub for soaking and ample shelves to hold all your essentials. Relax and rejuvenate at Wake Foot Sanctuary with a 45-minute foot soak that includes tea and a warm neck roll. Choose from 10 different soaks like Lavender-Chamomile, Tea Tree & Mint or The Melt with ginger and shea butter. Make lasting memories by attending a marbling workshop at Majik Studios in the River Arts District. Float paint on a thick gel to create a one-of-a-kind souvenir scarf. The workshop is offered on Mondays at 10 am or Fridays at 1 pm (please inquire regarding other times for workshop based on instructor availability.) Guests booking this package receive a 10% discount off our best rates in the Cowley Room plus $20 off workshops at Majik Studios included in rate shown. Includes all the amenities at Pinecrest with breakfast each morning, fresh baked cookies, and beverage center on our sun porch. Two day Biltmore tickets can be added to your reservation too! Dates available from May 28-Sept 30, 2019, in Cowley Room. Offer available on our website or by phoning 828.281.4275. Appointments at Majik Studios and Wake Foot Sanctuary must be made at the time of booking and are subject to availability.